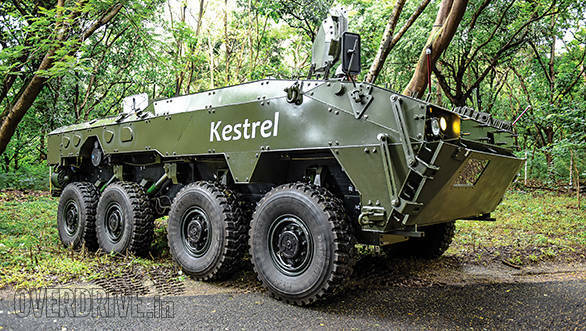 Tata Motors appears serious about its defence business and it recently gave us the opportunity to sample the Kestrel, an 8×8 wheeled armoured amphibious fighting vehicle which could soon be providing protected mobility and firepower to our troops. Military armoured vehicles first made their appearance at the beginning of the twentieth century and were used extensively in both WWI and WWII. With tanks becoming more common and lighter versions also emerging subsequently, armoured vehicles became less important for armies in many countries. But the conflicts in Iraq and Afghanistan completely changed that. It's in these countries that the US and multinational forces rediscovered the value of 8×8 APCs (Armoured Personnel Carrier) in rural and urban battles. Due to their speed and varying protection levels, there is now quite a demand for 8×8 vehicles. They not only move troops, but are also built with a modular architecture that enables them to be altered to suit a particular mission.association with the Indian Defence Research and Development Organization (DRDO) which has funded the development cost. The Kestrel weighs 22.5 to 26 tonnes depending on the configuration and it's powered by a Tata Cummins diesel engine that makes 600bhp (608PS). Tata refuse to share the torque figures but claim it's quite high. The Kestrel can carry up to 10 soldiers and a crew of two. Seats for the troops are equipped with an energy attenuating mechanism that shields them from the effect of blasts. The seats actually move and absorb the impact of the initial blast as well as the secondary slam down of the vehicle, reducing the severity of injuries to the spine and brain. In the style of the Russian army, the seating for soldiers is back to back, allowing them to use the 4 gun ports on each side. The Kestrel has four-wheel steering on the front two axles and a relatively short turning radius of 19 metres. The double wish bone type independent hydro pneumatic suspension, along with the impressive wheel travel, provides excellent all terrain mobility and a fairly comfortable ride. Yes, though we did not get to drive the Kestrel, we did get a ride in it and found the ride comfort, acceleration, braking and overall performance to be quite impressive. All the eight tyres have run flat capability with central inflation (CTIS) as standard. The amphibious propulsion employs rear mounted twin waterjets that do not require any preparation before entering water. Only the Anti-Surge Vane is raised to ensure water flows over the roof. The Kestrel can achieve 100kmph on land and 10kmph in water. The architecture of the Kestrel is modular with interchangeable snap-in modules. This means it's easy to customize and can be configured to play the role of a CBRN (equipped with chemical, biological, radiological and nuclear protection) reconnaissance (recce) vehicle. It can also be configured to be an APC, ambulance, missile carrier, or a command post, a field headquarters used by the commander of a military unit. 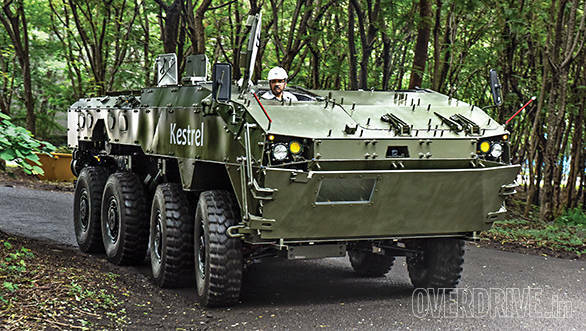 The Kestrel can be a support vehicle for engineers working in the field and given the times we live in, it will surely be used for anti-insurgency and anti- terrorist operations. The monocoque of the Kestrel comprises of a welded armour steel hull with applique and inner composite spall liner and depending on the configuration, it can withstand threat levels ranging from Stanag I to Stanag IV. 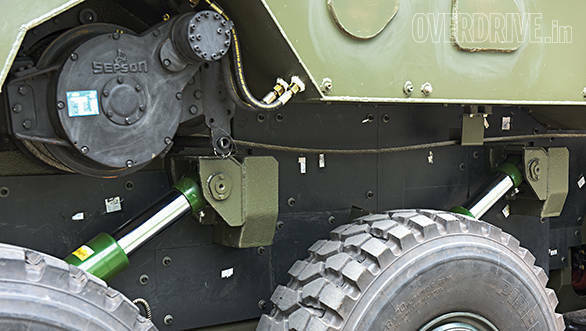 Stanag standards are a NATO standardisation agreement covering the standards for 'Protection Levels for Occupants of Logistic and Light Armoured Vehicles'. Stanag I dictates that the vehicle should be able to withstand hand grenades, unexploded artillery fragmenting submunitions, and other small anti personnel explosive devices detonated under the vehicle. 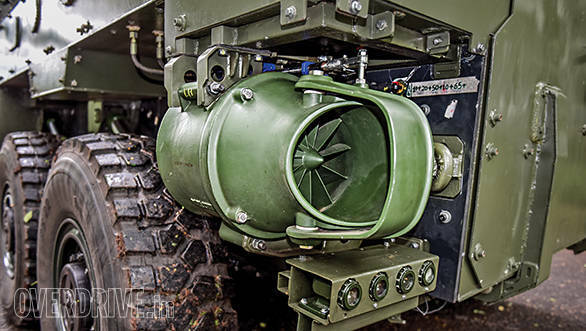 Stanag IV states, among other parameters, that the vehicle should be able to withstand a blast of a 10kg mine under either each tyre or under the vehicle. Interestingly, the protection modules of the Kestrel can be replaced in the field, increasing or decreasing protection levels as per the mission requirements. The belly has a blast guard that can provide up to Stanag III level protection. As its modular, the Kestrel can accommodate different variety of weapon stations and a one man or two man turret (for all calibres) depending on its application requirements. It can be armed with a 30mm remotely operated cannon, a single 7.62mm co-axial MMG (medium machine gun) and an automatic grenade launcher. In addition, it's capable of being fitted with a Javelin anti-tank missile station with two fire and forget missiles. The Kestrel doesn't just have firepower, it also has some smart stealth technology. This makes the Kestrel less visible to radar, infrared, sonar and other detection methods. 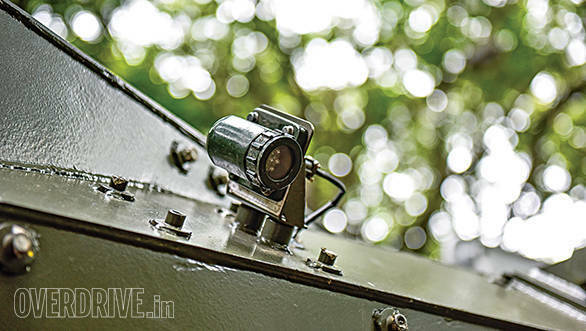 Tata engineers have tried to create a bit of mechanical military camouflage by managing and limiting the engine and vehicle sound, heat and thermal footprint, EMI or Electromagnetic Interference and EMC or Electromagnetic Compatibility. To reduce the thermal footprint, the exhaust gases are passed through water to ensure they are cool when released in the atmosphere. With all-terrain ability and a powerful engine, the Kestrel can cross a trench of up to 2 metres width and vertical obstacles as high as 0.7 metres! It also has an on-board winch to enhance off-road ability. 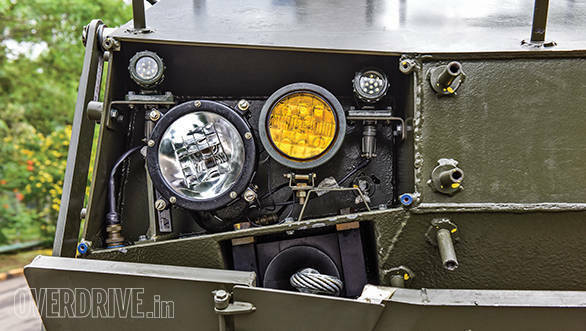 In combat mode, the driver shuts his hatch and utilises multiple cameras with day and night vision to steer the Kestrel. When in water, he also has three periscopes to aid him. The engine is mounted on the left in the front for better ergonomics and optimum space utilisation. 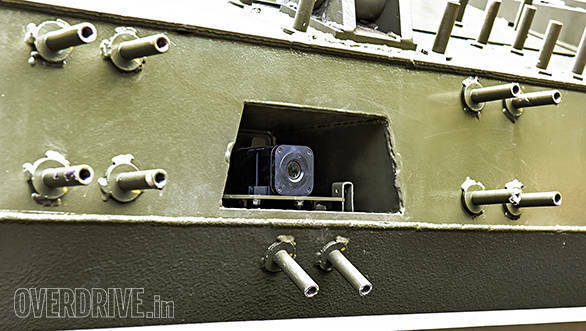 The driver and commander have their own roof hatches while the rear compartment for soldiers is accessible through a rear door and roof hatches. The Kestrel is 7.8 metres long, 2.95 metres wide and 2.28 metres tall. It uses a GPS system for navigation and can be fitted with UHF, VHF or HF wireless systems for communications. 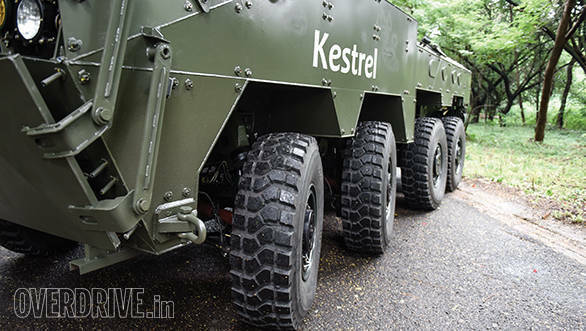 As I write this, the Kestrel is undergoing trails and tests with the Indian army, for its amphibious mobility and manoeuvrability on mud, slush, deep waters, and over steps and across trenches. Ballistic testing for its ability to withstand attacks will also be done and it's likely that the Kestrel will be commissioned for field operations in the future. But in the meanwhile, I earnestly request Tata to please loan me one, even if it's for just a few days. I have a war to wage with the innumerable trucks, taxis, buses, and all sorts of other vehicles that are driven so rashly on our roads. I would love to blast these buggers to the back of beyond. Yes, the modular Kestrel should also be configured for strict traffic policing and given to us. Load. Aim. Fire. 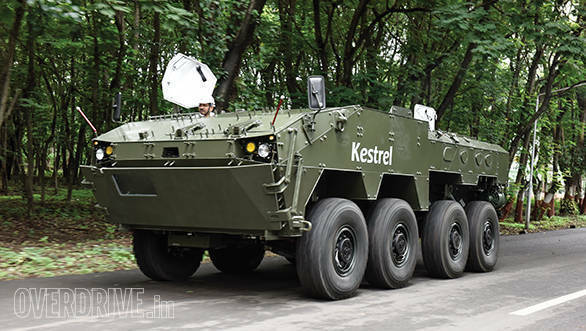 Tata's armoured personnel carrier is named after a small falcon  the Kestrel. In India you can easily see it in the Little Rann of Kutch and also in grasslands and open country with short vegetation and few trees. Though it's small in size, it packs the fierce force of a predator into its small body. The Kestrel hunts in quite a typical manner. It hovers around 10 to 20 metres above the ground facing into the wind, flapping and adjusting its long tail to stay in place and when the time is right, it dives down on its prey, usually small mammals, lizards or large insects. Kestrels can also fly in stationary air, even indoors in barns. They are elegantly buoyant in flight and sometimes even catch their victim on the wing, like much bigger raptors. They are known to conserve energy in a hunt and pick their positions. Once committed to an attack, they usually follow through to the end. And though they have small feet, they are the strongest amongst creatures of their size.